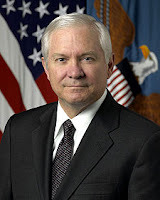 The cuts in the budget of the Department of Defense announced by Secretary Gates are sure to provoke anger and lots of hot air as politicians of both parties defend military spending in their respective districts. While it’s good to see that the administration is no longer treating the defense budget as sacrosanct and untouchable, the changes proposed by Mr. Gates are small – tinkering around the edges of the humongous drain of tax dollars that is centered in the Pentagon. Gates’ approach also compounds the nation’s economic problem because it will result in more layoffs – military and civilian – just at the time the nation needs more, not fewer, jobs. Gates is not the first SecDef who is trying to bring the DoD budget in line with economic realities. William Perry, in the Clinton administration, attempted to save taxpayer money by repositioning the military to reflect the realities of the end of the Cold War, but was only partially successful in holding back the military spending binges of Newt Gingrich and his Contract on America. There are two things missing from Gates’ initiative that would make it more real than symbolic. First, the cuts need to be made based on military priorities, not the power of individual congressmen trying to keep dollars flowing into their communities. Over the years, the Base Closure and Realignment Commission (BRAC) has done a fairly good (albeit not perfect) job of doing its job in the decommissioning of military facilities. An independent BRAC-like panel should be empowered to work with the military to develop apolitical strategies for cuts, consolidation, and efficiencies. Leaving the details to Congress will only result in protecting fiefdoms at the expense of national security and economic sense. In addition, we need a critical examination of the rationale for having military bases all around the world when economies in Europe and Asia are doing better than ours. Any solution must include a soft landing for those military, civilian, and contractor personnel whose jobs are eliminated. Putting them on unemployment compensation is not the best way to accomplish this. In the short term, we need to provide training, job placement, and stimulus projects for these American heroes so that we can improve the long term quality of life for all Americans. More importantly, the administration needs to end the senseless wars in the Middle East. I wish I could trust President Obama when he says that combat operations in Iraq are over, but how many times did I hear similar pronouncements from his predecessors over the seemingly endless, but now relatively short war in Viet Nam? There are plenty of non-economic reasons to end these wars, but the fact that we are sending bombs and bullets to Iraq and bribes to Afghan war lords is a major impediment to our economic recovery and stability. There will be a lot of hand-wringing by Congressmen of both parties if we take away their ability to distribute pork, and primarily by the Republican/Tea Party if we end the Bush oil wars. But we need to realize that national security is not just a function of military might, but it is also a function of a stable economy and educated work force, both of which have been mishandled in the last decade. Using some of the savings to prepare the displaced workforce for 21st century jobs is a better investment in our security than these senseless wars.